The honour roll commemorates employees of the Queensland Railways in Townsville who enlisted for service in World War One. The Minister for Railways, Mr Adamson, unveiled a handsome honour board at Townsville Railway Station on the 15th April 1916 in the presence of a large crowd of railway employees and the public. 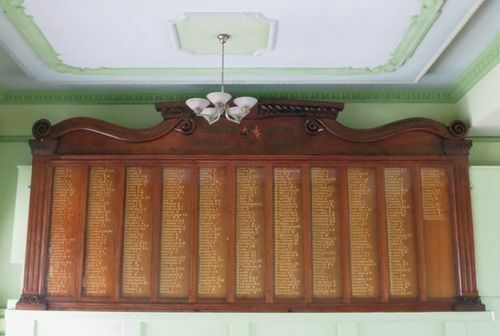 The board contains the names of 219 employees of the Northern Division who had gone on service. The Brisbane Courier (Qld), 17th April 1916. The honour roll comprises 11 panels set into a framework of carved cabinet timbers, constructed by Alfred Hammett. There are 10 panels each listing 45 names, the 11th panel with 18 names making 469 names in all.